Birthday Keepsakes has been making personalized keepsakes for over 25 years. 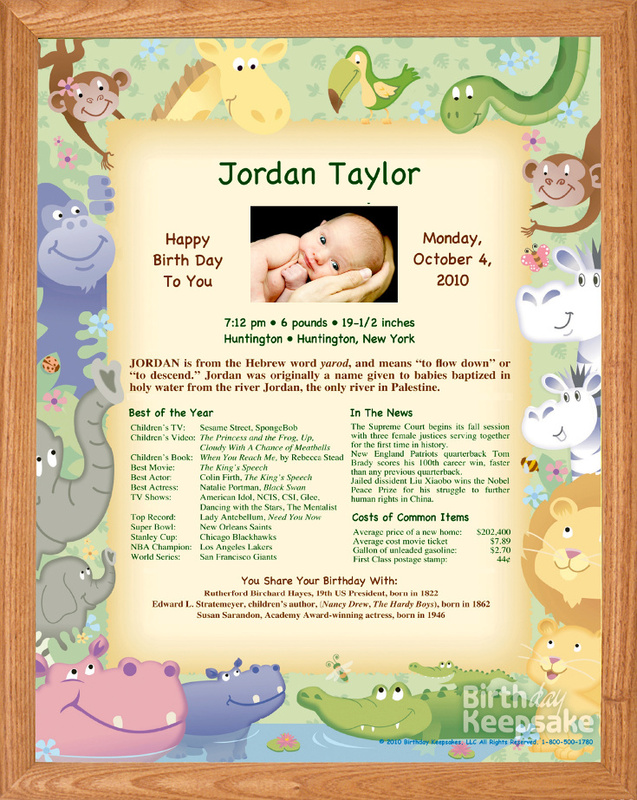 Their premiere product is the Day-You-Were-Born Birthday Keepsake which makes a special and touching memory about the special day your child arrived. Including personalized facts about your little one, as well as fun facts about the day and year, it will keep the memories of that amazing day fresh forever. The day your baby was born is a day to remember! You can remember that special day with a beautiful art-quality color print personalized for your little one and filled with fun and interesting information about that day and year! With 20 colorful and exclusive designs in 2 styles (newsy or artsy), you can get one that complements your baby's room or baby book. Three sizes, add a baby photo, laminate or frame it, make it just the way you like it. Cassandra's review- The customization was simple and with just a few options to select I was able to preview my choices and checkout. The shipping was fast and the product arrived just as ordered. I was happy with the result and overall time from ordering to delivery.